Want to experience the tradition of Norwegian farmhouse ales in a stunning setting? 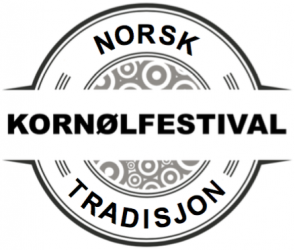 Come to Norsk Kornølfestival, the only festival dedicated to traditional farmhouse ale. The festival program has more details about what happens at the festival. This is less expensive, but a bit more complicated, and you don’t get to attend the brewing session (see below). The DIY page explains what you need. This ticket is the best way to experience the festival, but also the most expensive (4400 NOK for 1 person, 5700 NOK for 2 people). If that’s too expensive for you, there is also the do it yourself option (see that page). The highlight is really the brewing session, which shows how traditional kornøl is made in Hornindal. 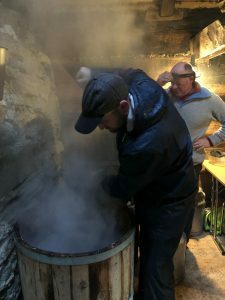 You get to participate in brewing a raw ale with juniper infusion and kveik, in a traditional brewhouse, with a brewmaster who grew up in the tradition and has his own kveik. See here for more information. If you get this ticket you need to make two choices. Brewing session on Friday or on Sunday. The ticket is the same for both, but you need different flights. We’ll contact you to find which option you want. Ticket for one person or two people. Since a double hotel room is included in the ticket, you can decide to be two people sharing it and buy the 2-person ticket. Or you can stay in the room alone and buy the 1-person ticket. Brewing on Friday: Arrive at Ålesund airport Thursday October 10 by 16:30 at the latest for the bus to Hornindal. You’ll be met with a sign saying “Norsk Kornølfestival.” You’ll be delivered back to the airport on Sunday October 13. The brewing session will be 11-16 on Friday October 11. 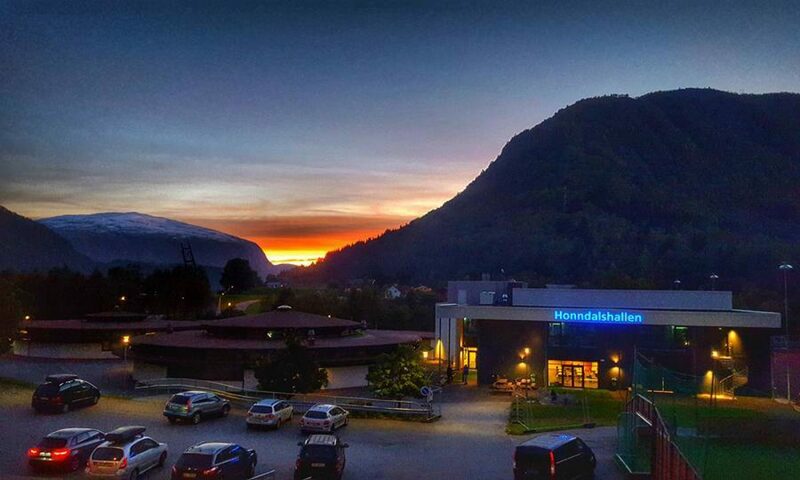 Brewing on Sunday: Arrive at Ålesund airport Friday October 11 by 16:30 at the latest for the bus to Hornindal. You’ll be met with a sign saying “Norsk Kornølfestival.” You’ll be delivered back to the airport on Monday October 14. The brewing session will be 12-17 on Sunday October 13. See below for suggested flights. Buy the ticket on Tikkio. If you take any of these flights you can use our shuttle service, although you may have to wait a while at the airport. Recommended flights to Ålesund airport Thursday 10th. Probably there will only be one shuttle, so guests arriving early must wait for the 1620 flight to arrive. Recommended flights to Ålesund airport Friday 11th. Probably there will only be one shuttle, so guests arriving early must wait for the 1620 flight to arrive. Recommended flights from Ålesund airport Sunday 13th. If necessary there will be two shuttles, one for the 1210 flight, and one for the 1635 flight. Those using later flights will have to wait at the airport. Recommended flights from Ålesund airport Monday 14th. There will only be one shuttle, in time for the 1635 flight. Those using later flights will have to wait at the airport.